The B22-SUB is a high performance subwoofer designed for ground stacked applications, housing two long excursion 18” drivers built into a bandpass horn cabinet design. 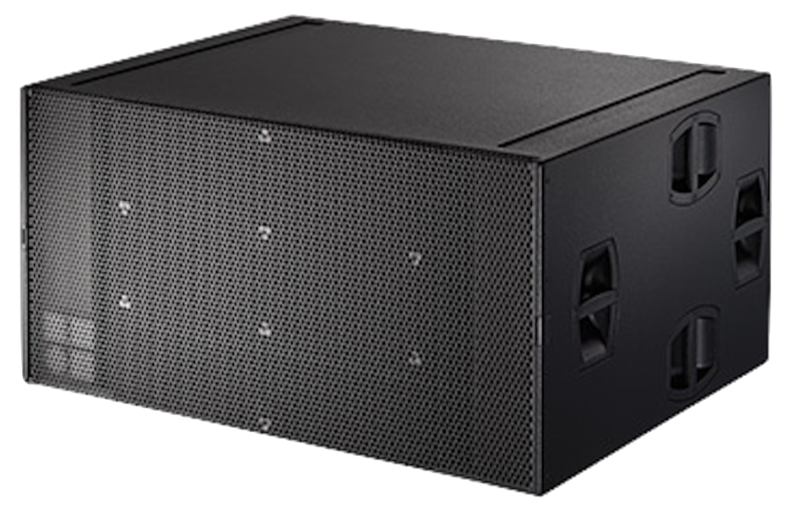 With high Sound Pressure Levels and an extended frequency response, the B22-SUB is ideal for any large format sound reinforcement application. When operated in INFRA mode, the B22-SUB can be used to complement other d&b subwoofers by extending the frequency response of the system. When three or any multiple of three B22 subwoofers are used, they can be positioned in a Cardioid Subwoofer Array, achieving impressive directivity control at lower frequencies and significantly reducing the energy radiating towards to the rear. The cabinet is constructed from marine plywood, and has an impact resistant paint finish. The front of the loudspeaker cabinet is protected by a rigid metal grill backed by an acoustically transparent foam. The side panels of the B22-SUB both incorporate four handles, whilst four wheels are mounted to the rear. The enclosure features two runners to protect the bottom panel from scratching. Two correspondingly shaped recesses are incorporated into the top panel of each B22-SUB cabinet to accept these runners, preventing cabinet movement when stacked.